Classes 753 and 754 were preceded by class 751, from which they differed externally. 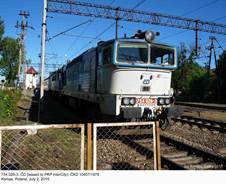 751 186-8 was photographed in Frydlant, Czech Republic, on June 12, 2003. 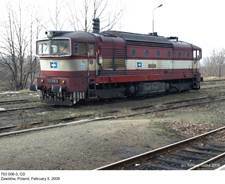 Czech 753 006-3, photographed at the border station Zawidów on February 5, 2009. Slovakian 754 071-9, Vrutky, April 18, 2009. 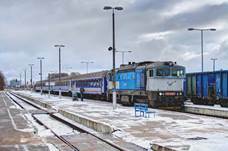 754 046-1, leased by PKP InterCity, photographed in Suwałki on January 4, 2015. Photo by Krzysztof Dobrzański (http://swr.podkarpackakolej.net). Side drawing of the class 754 locomotive; source: AV vol. 2. 754 026-3 arrives in Korsze with a train from Białystok. This train will continue to Warsaw, hauled by an EP07 (currently idle). July 2, 2015. Modernized 753 718-6, operated by Unipetrol Doprava; Petrovice, Czech Republic, March 9, 2010. Classes T478.1 and T478.2 (later 751 and 752, respectively) of Czechoslovakian state railways ČSD were intended mainly as a replacement for steam locomotives, still used in large number on non-electrified lines with both freight and passenger trains. Prototype was outshopped from ČKD works in 1964 and production lasted until 1970, totaling 312 examples. As they proved slightly too weak for many tasks, modified T478.3 followed in 1968. Despite similar designation it differed in many details. 1500 hp K6S310DR diesel engine was replaced by more powerful K12V230DR (one prototype was tested with older K12V220DR), rated at 1800 hp, and external appearance changed substantially. T478.3, later re-classed 753, was a universal locomotive for passenger and light freight trains, fitted with vapor car heating system. Production totaled 408 examples in seven batches, differing in minor details; last were delivered in 1977. 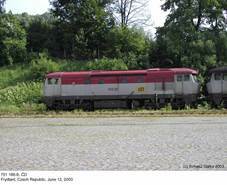 The number of vapor-heated passenger cars in the ČSD fleet declined rapidly and there was a growing need for a diesel locomotive with electric train heating system. This materialized in 1975 as class T478.4 (later 754), externally similar, but fitted with up-rated 1985 hp K12V230DR engine, necessary due to higher power demand. Removal of car heating boiler allowed for substantial increase of fuel tank capacity, from 2 500 to 3 600 litres. Apart from two prototypes, which different from production machines in several details and were later re-classed 754.2, 84 examples were built between 1978 and 1980 in two batches (24 and 60 examples, respectively). It was intended to order two more, numbering 60 and 36 examples, respectively, but these plans were seriously disrupted by a fire that badly damaged the ČKD Smichov diesel engine works in summer 1980. Manufacture of diesel engines had to be terminated for a few years. When production could be re-commenced, the need for new passenger diesel locomotives had declined substantially, mainly due to the progress of electrification. No more 754s were thus ordered. After the break-up of Czechoslovakia Czech and Slovak operators took over 60 (including both prototypes) and 26 locomotives, respectively. As many as 163 class 753 locomotives were rebuilt with steam heating boiler replaced by a diesel generator and re-classed 750. There were also several other modernization packages (classes 752.6, 753.7, 755, 756 and 757) – most of them included re-engining with the Caterpillar 3512 diesel. Eight modernized locomotives were delivered to Italian operator Ferrovia Adriatica-Sangritana (FAS) and classed D752.5. Classes 750, 753 and 754 were very similar externally and due to characteristic cab windows immediately earned the nicknames of ‘Brejlovec’ (Czech Republic) and ‘Okuliarnik (Slovakia) – both ordinary expressions for a person wearing spectacles. In April 2012 Wrocław-Based STK leased 753 741 from CZ Loko for a few months; the same locomotive was leased again in June 2013. Most probably it has already been returned. 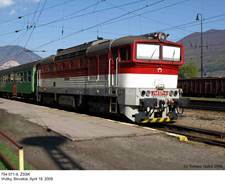 In mid-2013 PKP InterCity, pending the delivery of new diesel locomotives from Newag and Pesa, decided to lease four 754s from ČD. 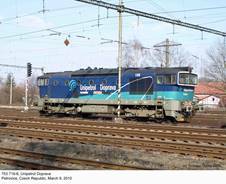 They were intended to operate at the Hel peninsula (where six-axle diesels are not allowed, due to their impact on tracks) and several non-electrified lines in north-eastern Poland. In summer 2013 754 025 underwent service tests and was fitted with additional equipment, demanded by Polish traffic safety regulations. All four locomotives (with service numbers 025, 026, 037 and 046) arrived in June 2014. In January 2015 the fifth example followed, 754 028. It was planned to return them in 2015, but due to teething troubles with indigenous SU160 the leasing period was extended and all five are currently intended to remain in use until the end of 2019 – suitable contract was signed in November 2017 and includes an option for further two examples. For the reason mentioned above, Czech 754s, which have retained their original liveries, were immediately dubbed ‘Nurek’ (diver). 1) Class 753 and class 754, respectively. 2) Leased, including one 753. - article by Piotr Kilanowski (SK vol. 9/2016).